"After all, you want your product to reach the customer in perfect order"
Solidus Solutions has developed packaging for various kinds of Chinese vegetables. They did this in cooperation with Freshchoi BV. The packaging has a moisture-resistant coating and offset printing. This makes it clearly recognisable in the fresh fruit and vegetable sector. 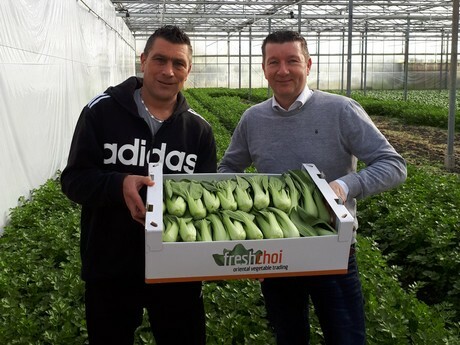 According to Lauran Jansen, Sales Manager at Solidus Solutions, "Freshchoi BV, who cultivate various Chinese vegetables in Berkel en Rodenrijs in the Netherlands came to us. They did this because they were looking for a stronger type of packaging for their product." Solidus Solutions is a Dutch packaging company. In the first meeting with Solidus Solutions, Jan-Willem Schinkelshoek, Freshchoi BV's co-owner, indicated that their products are often packaged in humid conditions. "One of their requirements was that the package still looked good. This was to still be the case after cooling and transport. In the end, you want your product to arrive at your customer in perfect condition", says Jan-Willem. Solidus Solutions solid cardboard lends itself to this. A PE coating can be applied to the cardboard. This is a moisture-resistant barrier. It ensures that the packaging stays sturdy even after it comes in contact with water. "The product used to be sold in packaging with one-dimensional one-colour printing. Freshchoi could not distinguish themselves from their competition. It would have been a missed opportunity to not include Freshchoi's name in the development of the new packaging", says Lauran. "It was decided to produce a strong, solid, moisture-resistant solid cardboard tray. The packaging also had to have client-specific offset printing. This was done in collaboration with Schinkelshoek Communicatie. " Schinkelshoek Communicatie is an advertising agency based in Rotterdam. This change in packaging delivered positive results. Shortly after its introduction, customers were specifically asking for Freshchoi's product. "With this unique packaging, we are now clearly recognisable in the market", concludes Jan-Willem.